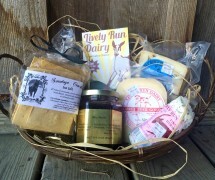 Give the gift of local cheese! The Lively Run Cheeseboard Gift Basket includes 3 pieces of Cheese: Finger Lakes Gold, Plain Chevre, and our Cayuga Blue, Seasonal Jam, and Petit Toast crackers. Please call 607-532-4647 if you would like to order over the phone for pickup at Lively Run.